Even unknown women artists deserve to be given the star treatment, especially during Women’s History Month! I may have learned as a child to carefully lay burnt matches side by side in glue on paper to form star patterns, but I don’t think that equals the sophistication of native quill work. It is an art form that has always fascinated me because it is so darn time-consuming. 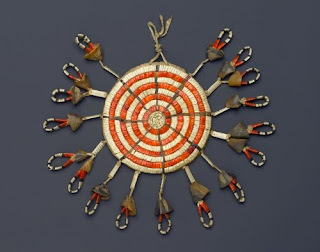 The origin of this bag, now backed with modern leather, is foggy—either it was a pouch to carry valued personal objects or it acted as tipi decoration. The Arapaho are a Plains culture that is thought to have migrated from the northeast during the 1600s to 1700s. Historically they were settled in Colorado and Wyoming. Nomadic buffalo hunters, they preferred to winter in the Boulder, Colorado area. By the 1700s, there were some branches of the culture in the Dakotas and Montana. By the time of white contact, the Arapaho extended from northern New Mexico, Oklahoma, and Kansas to Wyoming and South Dakota. Successive “treaties” with the US stripped them of their ability to roam, consigning the Southern Arapaho to central Oklahoma (after 1864/1865), and the Northern Arapaho to the Wind River Reservation in Wyoming (after 1878), which they shared with their traditional enemies, the Shoshone. Unlike other Native arts—such as the jewelry and weaving of the Navajo, the ledger painting of the Sioux, and the numerous types of trade art that rely on traditional forms—quill work is one Native art form that has fallen into relative obscurity. Only recently has it been given renewed attention by several First Nations artists. Quilling is an art form that has been done traditionally only by women. 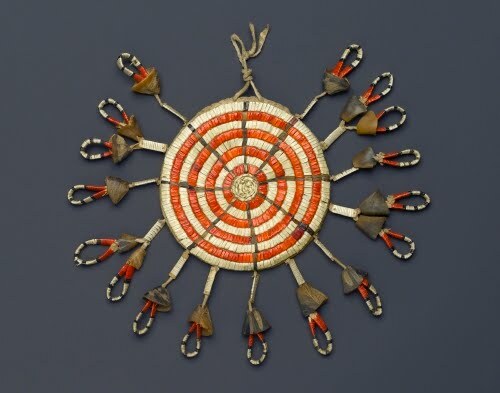 Porcupine quill work is one of the oldest aboriginal art forms. It is a time-consuming and multi-step process. First the quills must be prepared for use: they are sorted according to size, cleaned, and dyed. In the traditional manner, the artist would draw the quills repeatedly through her teeth which made them supple. The quills, split in half down the middle, are then applied to the design. They can be arranged in a zigzag pattern, plaited, parallel folded, banded, or woven.